Is It Time to Buy the iShares MSCI Emerging Markets ETF (EEM)? Emerging-market stocks have lagged U.S. stock markets, but will that trend reverse? Shanghai, China. Source: Wikimedia Commons user Michel_r. For years, fast-growing emerging markets have enticed investors who prefer high-growth investments, with huge populations of rising middle-class consumers representing massive market opportunities for the companies that serve them. Although major companies from the U.S. and abroad have sought to establish their own presence in the emerging-market world, investors also want exposure to the locally based companies that already have customer loyalty in those economies. The iShares MSCI Emerging Markets ETF (NYSEMKT:EEM) is one of the largest exchange-traded funds focusing on emerging-market stocks, and many investors use it to get exposure in this area. But is now the best time to buy this ETF, or would you be better served to wait for a stronger opportunity? Let's look at the iShares ETF and what role it can play in your portfolio. What is the iShares MSCI Emerging Markets ETF? The iShares MSCI Emerging Markets ETF owns more than 800 different stocks based in nations such as China, South Korea, Brazil, and South Africa. With $42.6 billion in assets under management, the iShares ETF is second in size to the competing Vanguard FTSE Emerging Markets Stock ETF (NYSEMKT:VWO). The MSCI index that the iShares ETF tracks includes large and midsized companies in emerging-market countries. The ETF has done a good job of tracking the performance of emerging-market stocks, although its 0.67% annual expense ratio drags down its relative returns, leading to slight underperformance compared to the index. Nearly all of the ETF's assets are invested in stocks, with only a fraction of a percent in cash and other assets, in order to address immediate liquidity needs among market makers. How has the iShares ETF performed lately? The performance of emerging-market stocks over time has been a source of consternation among many investors. Over the long haul, emerging markets have produced exceptional results, and the iShares ETF has produced an average annual return of more than 14.5% since its inception in April 2003. That performance enabled the ETF to double the cumulative return of the S&P 500 over that time. EEM Total Return Price data by YCharts. More recently, though, emerging-market stocks have been almost stagnant, even as the U.S. market has soared. Over the past three years, the iShares ETF has a negative total return compared to impressive gains for the S&P 500. The recent weakness of emerging markets compared to U.S. stocks reflects some investors' doubts about the future growth prospects of the world's most exciting opportunities. Some believe that central bank policies have propped up emerging-market stocks and that the end of programs like the Federal Reserve's quantitative easing could have a bigger impact on emerging markets than on developed economies like the U.S., Japan, and Western Europe. Yet contrarian investors argue that economic growth continues in emerging markets and that the failure of stocks to rise in concert could present a buying opportunity. Is the iShares ETF a good value right now? 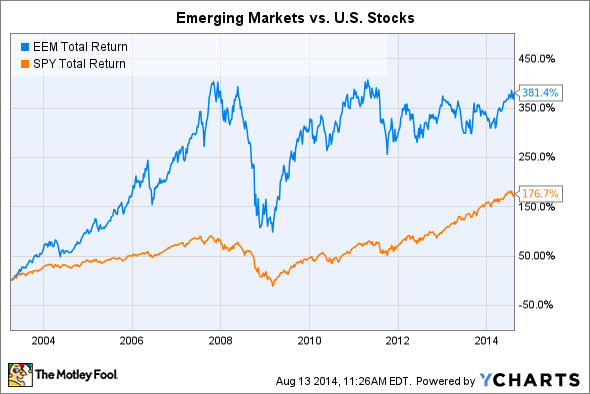 From a valuation standpoint, emerging-market stocks have rarely looked like a better bargain. MSCI says its emerging-markets index has a price-to-earnings ratio of just over 13 and a price-to-book ratio of 1.57. That's far lower than the global stock market's P/E of 17 and P/B of 2.07, suggesting that investors are in fact discounting the ability for emerging-market companies to keep up with their developed-market counterparts. What's uncertain is whether the trends that have held emerging markets back will reverse themselves in the near future. Commodities have played a big role in the rise of such markets, but the reversal of bull markets in commodities over the past couple years put a large dent in overall emerging-market stock sentiment. Moreover, economic instability in China and other major emerging markets has some economists worried about the sustainability of their growth, and a systemic threat to the newly established financial infrastructure in emerging-market countries could create massive disruptions. Those fears are keeping many investors out of the iShares ETF and other emerging-market investments. 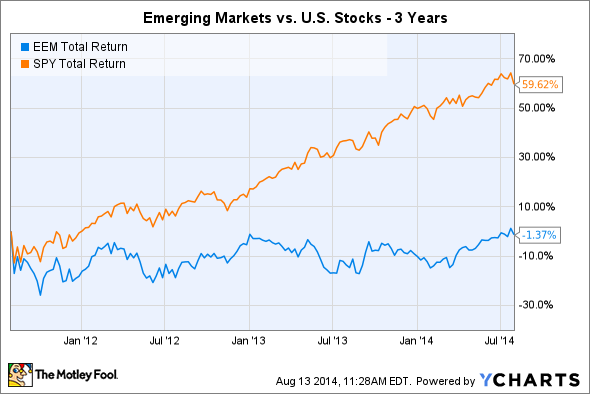 Is the iShares MSCI Emerging Markets ETF the best choice for emerging-markets investors? Investors have to decide whether the iShares ETF or the Vanguard ETF is the best way to play emerging markets, should they choose to do so. The iShares ETF has done better over the past five years, but the Vanguard ETF had better returns over the past one- and three-year periods. Moreover, the Vanguard ETF's 0.15% expense ratio is barely a quarter of what the iShares ETF charges. The two ETFs have subtle differences, though. Because it tracks a different index, the iShares ETF includes exposure to South Korea that the Vanguard ETF lacks. Even among those countries that both ETFs share, the proportions are different, leading to varying results. Despite its cost disadvantage, the iShares ETF is a popular and reasonable way to get emerging-market exposure for your portfolio. With most investors remaining extremely reluctant to commit to emerging markets during this time of market uncertainty, contrarian investors who believe that fears of collapse are overblown could easily see now as a great time to buy the iShares MSCI Emerging Markets ETF.